Sacked Aston Villa boss Paul Lambert was given money to spend but produced a team that was not "fun to watch", claims club director General Charles Krulak. Krulak, 72, also described suggestions that American owner Randy Lerner had not invested in the squad as "hogwash". 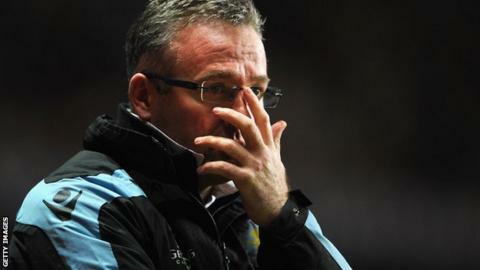 Lambert was dismissed on Wednesday after Villa slipped into the Premier League relegation zone. "Paul was just not bringing the team together," Krulak told the Sun. Scot Lambert, 45, described managing the struggling West Midlands club as "the toughest challenge" of his career. He said his "initial remit" was to "massively overhaul" the squad, lower the wage bill and keep the club in the Premier League. But after the 2-0 midweek defeat against fellow strugglers Hull, disgruntled supporters called for the former Norwich City manager Lambert to go. In 25 top-flight games this season, the club have managed just 12 goals - the lowest in Premier League history. "Randy was loathe to remove a manager mid-campaign," said Krulak. "But there was this intensely strong feeling, not least from the players and fans, that Villa should be doing a lot better. "Randy wants a team that - win, lose or draw - is fun to watch. But the opposite was true. "This idea that Randy had not put money into the club and that Paul's hands were tied is simply not true. It's hogwash." Krulak claimed the club's net spend during Lambert's two-and-a-half-year tenure was the highest of any manager employed by Lerner. Lambert, who was sacked in a phone call with chief executive Tom Fox, said the club wanted to "purchase and develop younger players" to give Villa a "solid footing" and "enhance the value of the playing squad in the future". Former Tottenham boss Tim Sherwood and United States coach Jurgen Klinsmann have been linked with the job on a full-time basis.